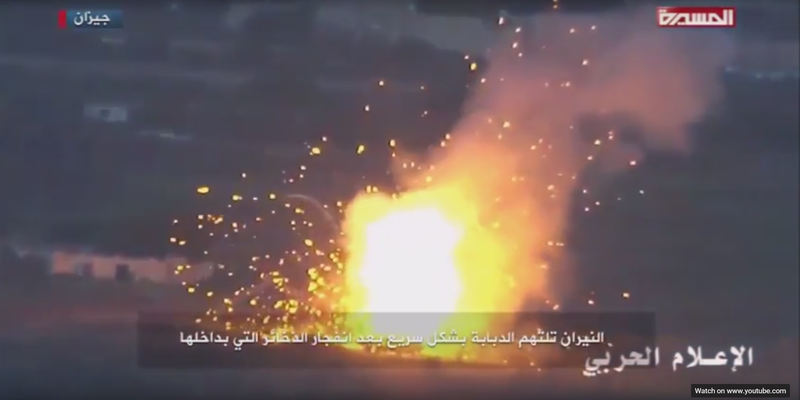 The video below shows what are said to be Houthi rebels in Yemen using anti-tank guided missiles to destroy American-made, Saudi Arabian-owned and operated Abrams M1 main battle tanks. The M1 is world renowned as one of, if not the finest main battle tanks in service, yet this video is clear reminder of how vulnerable even they can be to rudimentary anti-tank guided missiles. This video is graphic in nature and shows a real-world battlefield engagement that could have resulted in loss of life. Viewer discretion is advised. The missile system being used in the video appears to be a Tosun anti-tank guided missile (ATGM), which is an indigenously produced Iranian version of the prevalent Russian-built 9M113 Konkurs ATGM. These missiles are of a semi-automatic command line of sight variety, with flight-path information being updated in real time via a thin trailing wire attached to the launcher. The 32 pound missile has a range of about two and a half miles and has a high-explosive anti-tank warhead weighing in at six pounds. Generally speaking, the Konkurs ATGM and its clones are considered the little cousin to the also popular Kornet ATGM. The Abrams is an amazing machine, but it cannot bend the laws of physics, and if hit in the right area, it can be destroyed even by these relatively primitive and light ATGMs. New passive defensive upgrades to the Abrams, including reactive armor, could help with its suvivability against ATGMs, but still even these upgrades are not 360 degree total protection. Only active defensive systems, such as Israel’s Trophy system offer a high-degree of protection against incoming missiles and rockets from virtually all vectors of attack. Currently, this system, or one like it, is not installed on the Abrams family of tanks but could be in the future. It is unclear exactly what version of the Abrams tank the two shown in the video are. By now the entire Saudi Abrams force, equaling about 440 units, are thought to have been upgraded to M1A2 standard. Further upgrades to the M1A2S configuration, similar to the American SEP (system enhancement package), which includes enhanced depleted uranium armor and updated displays and optics, continue to this day, although it is unclear how much of Saudi’s Abrams fleet have been brought up to this elite standard. Additionally, it is never perfectly clear exactly what level of armor is installed when it comes export versions of the Abrams, with many countries receiving versions without depleted uranium panels on the front of the turret. There has been some debate as to Saudi Arabia’s extremely well-equipped forces’ abilities on the battlefield during the recent war in Yemen, and even in these videos, the tanks are sitting out in the open with their more vulnerable sides oriented towards the threat. A tank’s armor is strongest in the front and traditionally they will sit oriented looking out when idle on hills or ridge-lines, and will do so usually in groups so that some units can be constantly scanning for potential threats in every direction. Then again, this Houthi ATGM crew may just have been highly skilled or lucky when it comes to sneaking within range of such a deadly and capable weapon system. Maybe some of our tanker readers will chime in and comment on what they see in these videos when it comes to tactics and standard practices. Update Notice: Section removed about magazine safety, I flipped the idea of the Abrams handling systems and automatic ones when it comes to safety. Also clarified the ambiguity when it comes DU panels on export models. My apologies for the hiccup, long day!